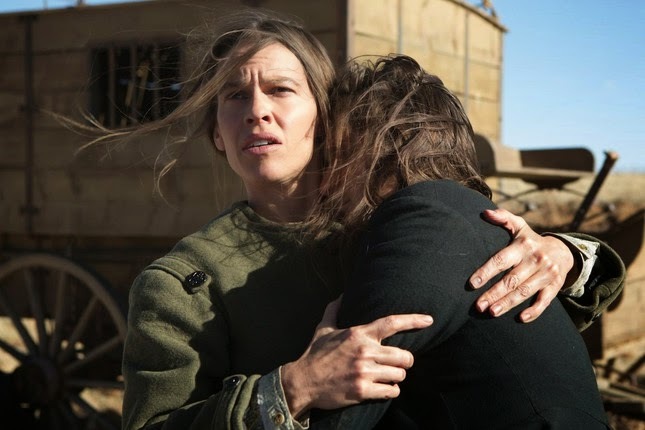 Hilary Swank is heartbreakingly good in The Homesman, where she plays Mary Bee Cuddy, a plain but forthright frontierswoman imbued with an almost shocking amount of decency. Certainly, she’s got more moral fortitude than just about anyone else in her small Nebraska town: When three local men write off their troubled wives as hysterics (all too easy to do in the mid-1800s) and determine that they should be taken far away to a refuge in Iowa, Mary Bee is the only one brave and compassionate enough to lead those women on their long trek. 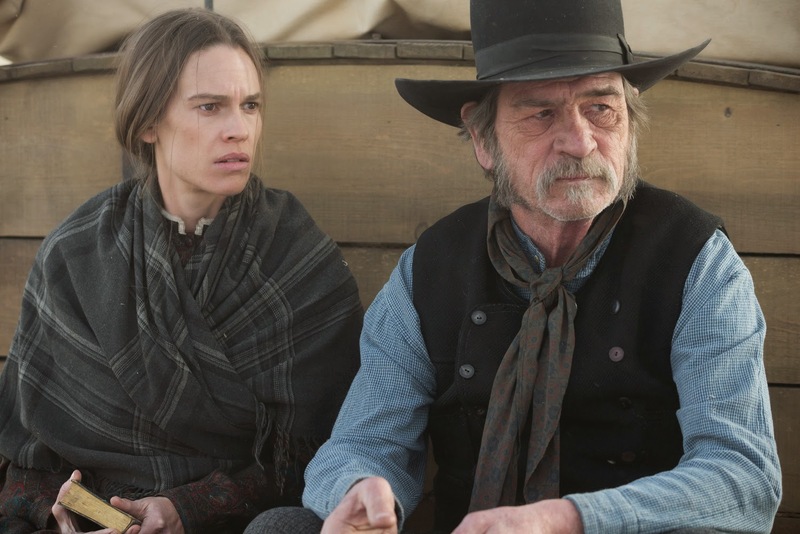 Soon she meets an irascible criminal (played by Tommy Lee Jones, who also directed the film) who can help her navigate the trail, but he, too, may be helped by Mary Bee’s moral fortitude. Swank garnered critical acclaim for her portrayal of Brandon Teena in the 1999 biographical independent film Boys Don't Cry, which earned her the Academy Award for Best Actress and the Golden Globe Award for Best Actress in a Motion Picture – Drama. She starred in Clint Eastwood's 2004 sports drama film Million Dollar Baby as struggling-waitress-turned-boxer Maggie Fitzgerald, which won her a second Oscar and Golden Globe for Best Actress. Mary Bee is so immediately relatable, but did you picture yourself in this role as soon as you started reading it? Sometimes I read great scripts that have great characters but I don’t see myself in them, and I just can’t be a part of them if that’s the case. I pretty much saw me in her right away. I really loved her, for all the reasons that you said, and she just does the right thing for the sake of doing the right thing. She has morals, she has values, she has manners ... and I think those are really a lot of things missing in the world today. I often hear the word earnest like it’s a bad thing. When did that become a bad thing? It’s heartbreaking, though, because Mary Bee has got so much generosity to go around, and the other characters don’t give it back to her in return. I think it’s part of what makes her so vulnerable and feel so alone, but it still won’t keep her from doing the right thing. I always said that Mary Bee goes where angels fear to tread. It’s very rare to be that selfless, but at least it’s something to aspire to. Why don’t people see her like she should be seen? I think the men don’t see her the way she wants to be seen because, in some way, she intimidates them. She’s perhaps more manly than they are. I don’t use that word to mean she’s like a man, but she’s picking up the responsibility that some of these men should be doing, so if anything, it might make them feel a little bit guilty about their lack of attributes in their own character. She’s self-sufficient, she’s independent, she’s really a modern-day woman in a lot of ways, and a lot of people can’t even handle that in 2014, let alone the mid-1800s. Though she might appear masculine in certain ways, Mary Bee will also go to great lengths to assert herself as a feminine presence, too, making meals and setting up her homestead just so for a potential suitor. You know what’s interesting? What we consider “masculine” and what we consider “feminine” — and I was sitting here talking about it, too. If you can blur those lines a little bit more and see that it’s not just the woman’s place in a home, and break down those stereotypes that only men are supposed to be out making the money or doing the hard labor, the more it lends us to helping each other through this walk called life. There is no right [or] wrong way to live as long as you’re doing the best you can and, I think, trying to live with some manners and values. It’s this fascinating video where a woman walks through New York City for ten hours, and all the times she’s catcalled are captured via a hidden camera. Oh, that’s interesting. Women are objectified like that all the time, every single day. Unless you see it for yourself — like that video obviously depicts — you don’t really understand what it’s like to be in that place of being objectified every single day, and trivialized. To me, this movie deals with that in a big way. It’s a feminist movie in a lot of ways, and I think it deals with how women carry themselves or hide from themselves because they want to be seen for more than just their looks. I know that when I became a teenager and all of a sudden was looked at differently, it was very uncomfortable. I immediately put on overalls and started wearing wool socks because I didn’t want to be looked at like that. Which is tricky, because you’re in a profession where so much of it is based on your looks? I do think that happens to men in this business, too, but in general, when young girls are looking at billboards of already-beautiful models that are being touched up, it’s completely unattainable to look like that. The idea that you have to look a certain way to attain love or to be successful in the world, those are the stereotypes we need to break down. It's interesting that being seen for who we are changes us, or allows us to be us. The ability to be seen is very important. Has walking in other people's shoes as an actress given you that empathy for other people? Absolutely. First of all, I think that coming from a very humble background has made me an empathizer in general. I sometimes have a hard time sleeping at night with all that's happening in the world. Especially before I go to bed, it just pulls at my heartstrings, and I wish that there was more of me to go around, to be able to do more. I don't only get to walk through these characters’ shoes, I get to see the world through their eyes. It totally broadens my blinders; it opens up many new ways of looking at things. To me, that's what life's about: We can celebrate people's differences, and once we blow past the unknowns, we're so much the same. That's what was so compelling about Boys Don’t Cry. You don’t see characters like Brandon Teena very often in the movies, but the big themes of that movie were so universal. Absolutely, and it's fascinating to me that people will say, "You know, because you're straight, I looked at this movie differently. It made me see that it transcended gender, that it was about a person." It made it not a gay story or a lesbian story in their eyes, which is crazy to me. In real life, it can be hard for people to relate to someone whom they perceive to be different. When you watch a movie, though, you can’t help but begin to empathize. It is astounding. I think we’ve all felt like an outsider at some point in our lives, and for me, especially as a child, I felt the pressure of classism. I would be embarrassed for living in a trailer park, and I would watch movies and see characters that were feeling things that I felt I was experiencing. I felt understood through those movies, and they became my friends, in a way, and I think the power of movies is astounding in that way. What is it like to be directed by the actor you’re sharing the scene with? You did it in The Homesman with Tommy Lee Jones, and Million Dollar Baby with Clint Eastwood. All of Tommy Lee’s words seem to be chosen wisely. Very. He has a brilliant brain, and he certainly doesn’t suffer fools and wear his heart on his sleeve — and why should he? He doesn’t have to do that to please people. If he doesn’t want to connect, he doesn’t want to connect, but in the end, I think that this movie is just a shining example of defying stereotypes. People see Tommy Lee as this intense man, but in the end, he made a feminist movie, a beautiful love-letter to women. I think it’s beautiful that he made that.